I just realized that I have not done one of these in four weeks! And so much good eating in that time too! I do post some of my food pictures to my Instagram though. It's just so easy to do it that way. For lunch and dinners the past few weeks, I've been trying to get creative with foods to fit into my new eating plan. I've discovered new-to-me foods and revamped some old recipes of mine. 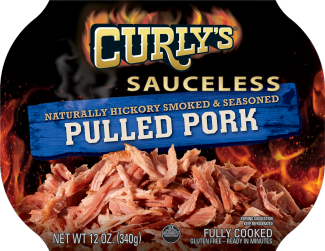 One of the new foods I've found (which is all gone now) is Curly's sauceless pulled pork. 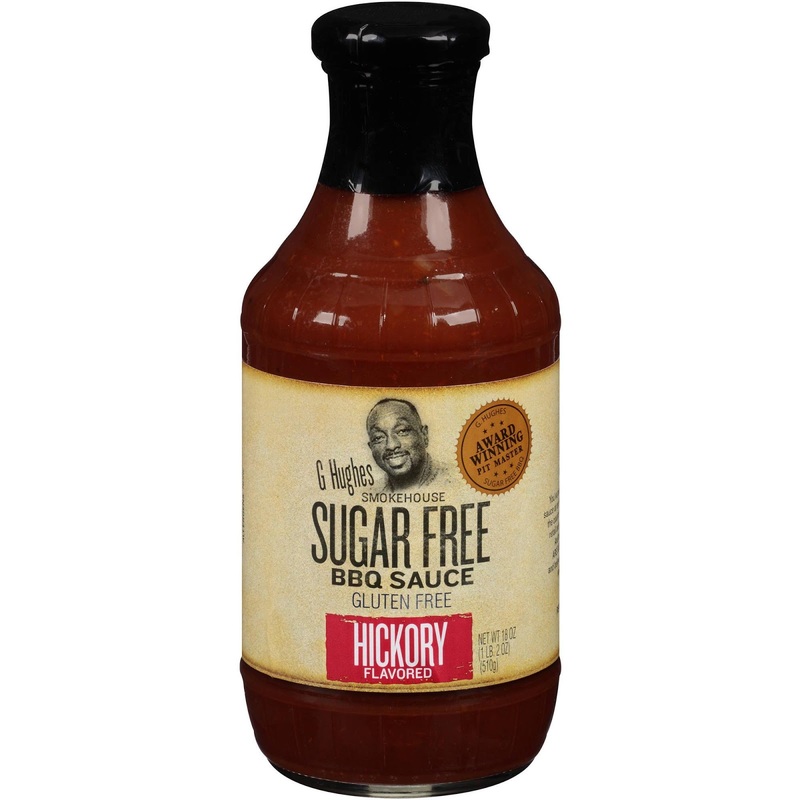 And I found a great tangy sugar free bbq sauce to go with it. Here are just a few times I've had it in the past few weeks. I think I was able to get 6 servings out of the container. At the beginning at the month I made Chicken Alfredo for dinner. I baked chicken tenders, then cut them up in chunks and cooked them on the stove top with broccoli. 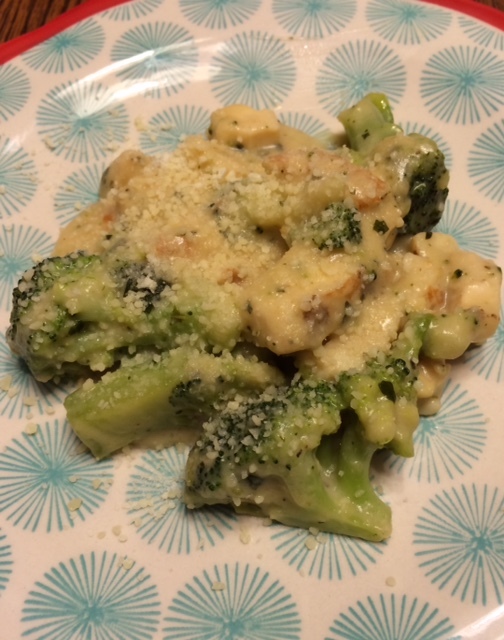 I used Bertolli Alfredo sauce (I'm not that good to make homemade sauce. Although I may look up a recipe next time I make this.) I ate mine just as pictured, but I made fettuccine for the menfolk. Amazingly enough, everyone liked this! This will definitely be made again. My lunches have also been delicious. I made Italian shrimp one day. I adapted it from this recipe at Just a Pinch. I cut the whole recipe down to at least a fourth, because it was just for me. I've eaten this plenty of times in the past though, but it always involved pasta. 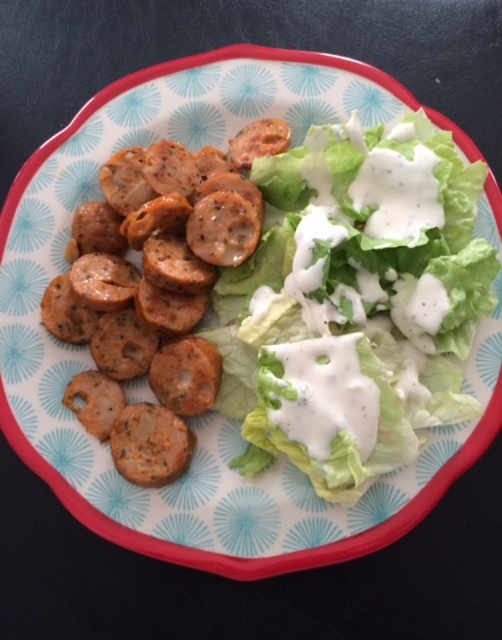 But this was simple, filling, and a satisfying lunch. 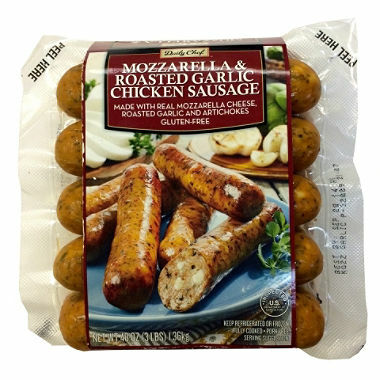 While at Sam's a couple of weeks back, I found this chicken sausage I wanted to try. It seemed like a great choice for lunch. Even though it came in a 15 pack, I decided to buy it anyway. I am so glad I did! It's fully cooked so you just have to warm it though. I decided to cut it into slices so all the little sides would get nice and browned in the pan. There were three flavors in all, but I just went with the one that sounded most appealing to me. Last, but not least, I made a big crockpot of the chicken taco soup. I got nine 3/4 cup servings out of it, and froze 4. I have eaten the four that were in the fridge (I ate one the night I made it.) The freezer ones will be good for a lunch or dinner on a night my husband cooks burgers or something. With Mexican blend cheese added on top!